You can enquire about this book and we will let you know the availability. The Title "J-Boys Kazuo's World, Tokyo, 1965" is written by Shogo Oketani. This book was published in the year 2011. The ISBN number 1933330929|9781933330921 is assigned to the Paperback version of this title. This book has total of pp. 212 (Pages). The publisher of this title is Stone Bridge Press. We have about 150 other great books from this publisher. 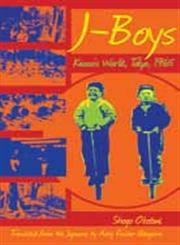 J-Boys Kazuo's World, Tokyo, 1965 is currently Available with us.